There are many ways to showcase your services and products to the large number of delegates at EIG Conferences, many of whom will be existing or future clients or customers. Sponsorship of the EIG Conference is a key way to increase your company’s visibility both throughout and after the conference. Numerous packages are available to suit every budget. 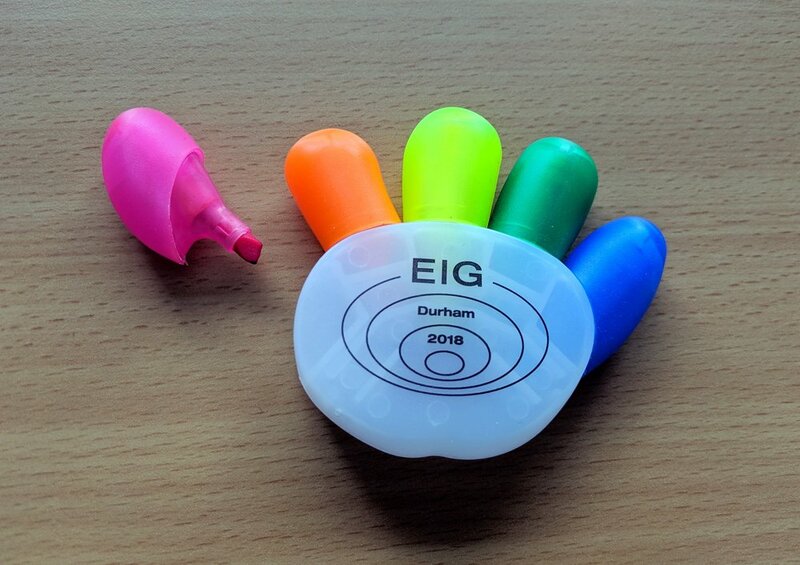 At the Durham conference September 2018 these included sponsorship of the Icebreaker Drinks, Conference Dinner Drinks, Session Advertising, Session Break Advertising, Conference Bag Inserts and EIG Approved Promotional Items. Major Sponsors, for which your Company logo will be displayed on conference bag, advertised during the event, on conference delegate pack, on screens and at start of each session on the printed programme. Your company logo will be listed on this website until the next conference. Session Advertising Sponsor, for which your Company logo will be displayed on screen for the relevant session, both before and after. Listed in the programme and the delegate pack and your company logo displayed on the website until the next conference. Break Advertising Sponsor, Posters advertising the sponsoring company during the event. Sponsors listed in programme and on the screens. Also published in the delegate pack. Company listed on the website until the next conference. Promotional Items, Companies can have their own promotional literature included in the conference pack for £100, or sponsor the EIG approved promotional items in return for their company logo being included in the conference programme. Sponsorship opportunities are limited and disappear quickly. Don’t let your competitors steal a march - so please contact us in good time!